The Lumberjack’s Ball by Carrie Fancett Pagels is the second book in the Christy Lumber Camp series but can be read as a stand-alone. 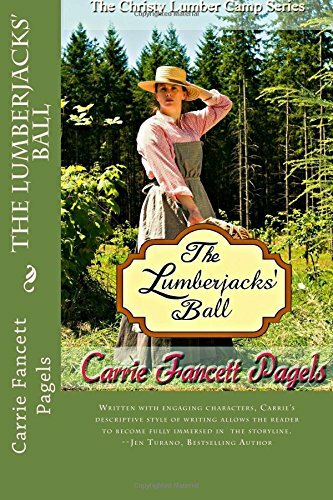 I love Carrie Fancett Pagels books as I don’t just read them page by page, I live through them. Ten years before the novel begins seventeen year old Janie suffered a horrendous attack. Since then she has hidden away from the world. As the novel opens, Janie has changed her name to Rebecca and her father has set her up to manage a new store in St Ignace, Michigan. Rebecca wants a new beginning but is still fearful. She hides herself behind drab clothes and a severe hairstyle. The reader is reminded that in God we can have new names and new beginnings. However Rebecca will need to let go of her past in order to move forward into the future that God has planned for her. Garrett Christy and his brother Richard also had their lives changed ten years earlier when they rescued Janie. They too have new names. Garrett began to exclude God from his life ten years earlier, as well as trying to take on God’s job as protector of the females in his life. Garrett needs to “forgive himself and let God back in his life.” Too often we take on roles that only God can fill. We need to let go and let God. The theme of forgiveness is a major one within the novel. When one withholds forgiveness it is impossible to ever move forwards. Unforgiveness keeps one trapped in the past and powerless. God’s wish that we “take care of the widows and orphans” is a theme that runs throughout the novel. There is an orphanage run by Sister Mary Lou who often takes her charges into town. Rebecca is particularly struck with Amelia and a beautiful relationship develops. Faith and trusting in God are of vital importance. God always has ones best interests at heart and has the power to transform situations. The reader learns that it is vital to listen to and obey the voice of God when one hears it. There is the theme of fathers in The Lumberjack’s Ball. Earthly fathers may be missing or uncaring but God our Father will never let us down. Garrett, though unmarried has a father’s heart. He feels protective to those less fortunate than himself. The Lumberjack’s Ball is a gentle romance. As the reader, it is delightful to see how feelings develop and to watch how situations progress. Carrie Fancett Pagels writes ‘living’ novels. One cannot read her novels as merely an observer, the reader is most definitely an active participant. I am totally loving the Christy Lumber Camp series and an picking up book number three Lilacs For Juliana next. If you have never picked up one of Carrie Fancett Pagels novels, you are missing out. Rectify the situation today – invest in one of her novels, you will be in for a treat. Julia, You have really blessed me with this wonderful review! Caring for the widows and orphans is definitely a theme. My readers tell me they hope to read about Pearl and French in another story of their own, so I am praying about it! In the lumber camps, guys were often given nicknames but especially for “Ox” and “Moose” they readily accepted those nicknames after the attack as a way to hide just as Rebecca chose to use her given name, rather than nickname of Janie (her middle name) as a way of distancing herself from the attack where she could have been killed. I love that you really “get” my stories and you are immersed in the characters and setting! Right now I have to get myself back to 1810 where my heroine, Martha, lives in Williamsburg, Virginia, and get myself into character so I can finish writing her story!!! Many blessings, Julia!!! Thanks!